From June 11 through June 20 this year, I had the pleasure of visiting Ukraine to tour libraries and meet with librarians. A generous grant and scholarship through Emporia State University paid for me and 12 of my classmates to participate in this opportunity to build international connections. Because of its location and agricultural resources, Ukraine has been battered from all sides throughout history. We stayed primarily in the city of Kiev and unfortunately much of this ancient city has been destroyed as Ukraine was dominated by one force or another, including the Nazis and most recently the Soviets. Beautiful churches that look centuries old often turned out to actually be only a few decades as Ukraine tries to rebuild what was lost under the Soviet system. The beautifully bright and glowing (and mostly rebuilt) church of St. Michael stands in shining contrast to the heavy, grey, somber Soviet building next to it. Under the Soviets, libraries did not flourish as areas of free intellectual activity. Instead, censorship, purging of records, and the retroactive changing of history were normal occurrences in Soviet libraries in the 20th century. Some material, like Ukrainian national poetry and songs, were simply destroyed while other precious works of art and literature were siphoned off by both Nazis and Soviets. Twenty years after gaining its independence, the country is still attempting to retrieve these treasures. They face impossible odds in attempting to recover these artifacts, but they are still trying. After so many decades of secrets and restricted information, Ukrainian librarians take a tremendous amount of pride in their freedom of information policy. Most libraries are open to all Ukrainian citizens; they simply must apply for a reader card and occasionally pay a small fee to belong to the library. At that point, the reader may access any information housed in the library. For example, the parliamentary library keeps careful records of all governmental and legal decisions made by Ukrainian politicians, and these records are available for any of their readers to peruse. For a region of the world that spent so many recent years under oppressive and violent regimes, this freedom of information is miraculous. Interestingly, with one notable exception, not a single library we visited had material that patrons could check out and take home. The exception to this was the wonderful children’s library in Kiev, which had a single room that housed books that the children could take home. A few libraries had a small collection of books that patrons could browse, but most libraries kept their books in vast depositories that were not open to the public. If a patron (or reader, as they are called in Ukraine) is interested in a particular book, he must fill out a request form with a librarian. The librarian will then fetch the book for the reader. This process, beginning when the reader fills out the request and ending when the book is in his hands, can take three to four hours. At the end of this slow process, the reader may take the book to a reading room for a period of time but he must return the book at the close of library hours. Few books (if any) ever leave the library. Ukraine celebrated its twentieth anniversary of independence this August. Like the beautiful churches destroyed by outside forces that Ukraine is carefully and lovingly rebuilding, the care and pride Ukraine takes in its libraries show a strong, resilient spirit. The librarians and library students we visited during our time in Ukraine envision a bright future for their country’s libraries but most of all they embody an inspiring example of what free and open information exchange means to the freedom of all people. Amy Campbell is a Reference Librarian at Marshall Public Library. A version of this article appeared previously in the Idaho State Journal. Two scholarships worth $500 each were recently awarded at the Idaho Library Association (ILA) annual conference banquet in Boise. The Scholarships and Awards committee received dozens of applications from highly qualified candidates. The committee carefully reviewed each application in light of the scholarship criteria. Ben Hunter was selected as the recipient of the Gardner Hanks Scholarship and Thomas Ivie was selected as the recipient of the Idaho Library Association Scholarship. (L-R): Ivie, Hunter. Photo by Kristi Brumley. Hunter is currently attending the Simmons College Graduate School of Library and Information Science in Boston, Massachusetts. He is pursuing a Ph.D. in Managerial Leadership in the Information Professions. Hunter holds the position of Head of Cataloging and Collections at the University of Idaho Library in Moscow. 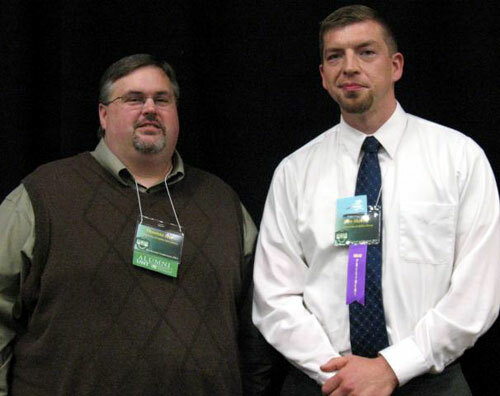 In addition, Hunter was the 2010-2011 President of the ILA and he was selected as part of the 2011 class of American Library Association (ALA) Emerging Leaders. Hunter also possesses a Master of Music in Composition and plays the Scottish Highland bagpipes. Ivie is currently pursuing a Master’s degree in Library Science from the University of North Texas (UNT). In addition to the ILA scholarship he was awarded the SWIM (South Dakota, Wyoming, Idaho & Montana) scholarship to attend the UNT distance graduate library program. Ivie is a Library Assistant in the Serials and Government Documents department of the University of Idaho College of Law Library in Moscow. He has worked in libraries for more than sixteen years and has been at the law library for more than thirteen years. He holds a Master’s degree in Public Administration. Ivie currently serves on the editorial board for the Idaho Librarian. He is Vice-Chair of the Moscow Parks and Recreation Commission, and serves on the board for Moscow’s club lacrosse team. Ivie plans to attend the ALA Annual Conference in Anaheim, CA in 2012. The ILA scholarship requires candidates to be a member of the ILA and to participate in an educational activity such as workshops, institutes, conferences or courses. The Gardner Hanks scholarship requires candidates to be a member of the ILA and pursue a formal library education. It is awarded to those who best match the vision of Gardner Hanks who was the 2001 Librarian of the Year. Candidates may apply for 2012 scholarships in April. They will be presented at the ILA Annual Conference in Pocatello in October 2012. Kristi Brumley is a Library Assistant at Boise Public Library’s Collister Branch and the College of Western Idaho. 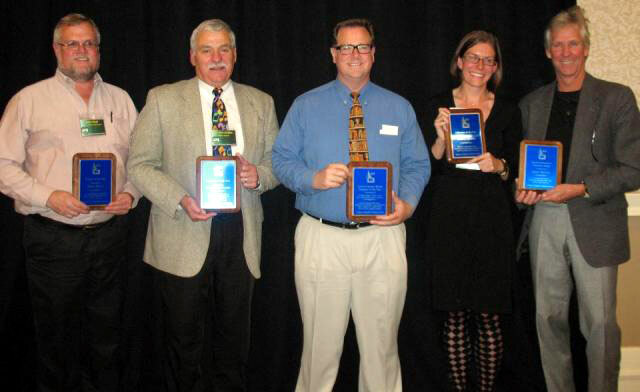 During the October 6, 2011 Idaho Library Association’s Annual Conference Awards Banquet and Ceremony the winners of educational scholarships and professional recognition awards were announced. The banquet also recognized the current MLIS (Masters of Library and Information Science) students and new librarians. (L-R): Held, Goedde, Taylor, Stroebel, Watts. Photo by Kristi Brumley. John Watts, of Veritas Advisors, was awarded Special Services in Libraries Award for his strong work in helping to reduce the negative effects of two legislative bills during the 2010 legislative cycle. One bill proposed to reduce the number of years a library trustee can serve from six to four, and the other bill proposed to filter internet to all public library users throughout Idaho. The latter bill was reduced to only apply to children’s computers, and the former bill was eliminated. Trustee of the Year was awarded to John Held who serves on the board for both Payette Public Library and the Idaho Commission for Libraries. A major triumph for Payette Public Library was accomplished with his leadership – a bond passing by 76% to provide money to build a larger, brand new library. Follett’s School Library Media Program of the Year was awarded to Librarian Gregory Taylor and the School Library at Hillside Junior High School. Taylor’s work to improve his school library on a limited budget has been incredibly successful. Taylor wrote and was awarded six grants, has collaborated statewide with various constituents to create beneficial teaching programs, as well as engaging programs with his students. Taylor also volunteered with the Ada County Juvenile Detention Center where students commented that they didn’t like reading until Taylor handed them the book Hunger Games. Taylor also was able to provide books to these students. Legislator of the Year was awarded to District 4 Idaho State Senator John Goedde for his incredible leadership in helping to reduce the effects of the Internet filtering in libraries bill. Goedde was instrumental in providing two days of open testimony regarding this proposed bill. Goedde’s collaboration with Idaho libraries has been strong, and he often works with Library Director Bette Ammon at the Coeur d’Alene Public Library on various programs. As a result of Goedde’s collaborations and leadership, the bill was reduced from requiring Internet filtering for all – both adults and children – and was changed to just filter the Internet for children’s computers. (L-R): Stroebel, DeWalt. Photo by Kristi Brumley. 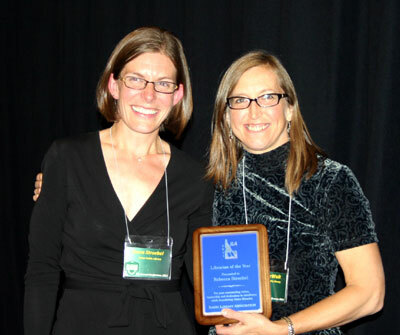 Librarian of the Year was awarded to Rebecca Stroebel of Boise Public Library. Stroebel’s nominating letters stated that she is a model librarian, who focuses her efforts statewide on various projects, including the Big Read. Stroebel also exhibited strong leadership working with legislators, citizens, and library staff around the state to effectively limit the Internet filtering bill from the 2010 legislative session. Congratulations to everyone, but especially to Idaho’s libraries, and Idaho library users who all benefit from this crew’s hard work. Amy Vecchione is a Librarian/Assistant Professor at Boise State University. Alan Virta, the Head of Special Collections and Archives at Boise State University’s Albertsons Library, retired on Friday, October 28, following a career of nearly 24 years at the university. I had the honor of sitting down with him recently and asking about his journey to Boise State University and some of the key events in his position as Head of Special Collections. 1987, when I applied. Well, I’d been working at the Library of Congress for 12-13 years and I was ready for a change. I had spent really what would have been my twelfth year at the Library of Congress on a fellowship. The Mellon and the NHPRC had a fellowship for mid-career archivists, people who’d been working for a while to go to another institution and do their work. There were three fellows a year, and my supervisor who may have suspected I was getting bored said, “Here’s the flyer, maybe you should apply for this.” So I went through the application process and the institution I went to, one of three, was the University of Southern Mississippi, Special Collections. There was an archivist and an assistant, and a clerk and it was mainly local history, and I really enjoyed working there for an academic year. Then I went back to my old job at the Library of Congress, which I loved, but any particular job can get old. And I got back there and just got to thinking, “You know, I really want to work in a situation like the University of Southern Mississippi.” So I started looking at the job ads, and I think I applied for 1 or 2 jobs, including one at SUNY Stony Brook and one at Boise State University. BSU called me first and brought me out for an interview. So I was looking, I really figured I’d probably need to be an assistant archivist someplace first. And I think that was mainly the type of position I was applying for at that time. And I know it was, but Boise State’s job was the Head of Special Collections and I figured I’d apply for it anyway and got the job. So that was your first job title, Head of Special Collections? I’ve always had the same job title. I was wondering if you could tell the story of traveling out here from Maryland in the middle of winter. Oh yes. Well, my first trip here was about this time in October for my interview. It was just a beautiful, clear pristine day, and just beautiful, that was October 1987. When Tim Brown who was then head librarian called me, it was October and offered me the job and said, “How soon can you get here?” And I said, “Well, it should be after Christmas.” In January, I headed out by car from Maryland to here and my brother came along with me. And it was clear sailing all the way to the Nebraska state line and then we hit Wyoming. It took 3 days to get across Wyoming because it wasn’t snowing but there was so much wind and they closed the interstate. And I think it was Rawlins where we got off the interstate in the middle of the day and from the truck-stop where we parked our car and were hanging out in the lobby or the entrance to the truck-stop and a jeep pulled up and the guy said, “Anyone want a ride to the Holiday Inn?” And we jumped in that jeep and we were in our hotel room by 2. That night on the news, six o’clock, they talked about the National Guard bringing people in who were trapped on the interstate, sleeping in the basements of churches, American Legion Hall, and I thought about how lucky we were. And at the same Holiday Inn, a Harlem Globetrotter bus was there. I think it was an advance bus or crew bus, didn’t see Meadowlark Lemon or anybody like that there. But it was something to see, to drive across Wyoming. Those tall posts along the side of the road that you sometimes wonder why they are so tall, well you know, you found out why they needed to be that tall. Driving across Wyoming was scary, seeing those trucks across the interstate; it kind of felt like a scene from Mad Max. But we got here. When you got here and started in January, what was the Special Collections staff comprised of, and could you talk about where it actually was? It was located on the second floor of the library where the books with call numbers A-E are now. There was a big counter for CRC (Curriculum Resource Center) which was about where it is now, it was an old-fashioned counter. We were in what I guess would be the south side of the floor. There was a huge space defined by a counter with file cabinets and shelves that was not accessible to the public. And behind the counter was the Government Documents collection. In the lobby type area where the computer labs are now, there were map cases and then there was a table that was at the very south end across from the Administration building. The archives and rare books were in that room. The third floor where all the study rooms are now, there was a room where basically all the manuscript collections, including the Frank Church Collection, were housed, so if someone wanted one of those collections we had to go upstairs. But the staff was just me and Leslie Pass, who was a Library Assistant III, and Leslie had been there many years. And she is the one who got me oriented to what we have and the procedures, and took me around and introduced me to people like at the Athletic Department, to Communications and Marketing, and Photo Services. And so it was just Leslie and I with some student assistants. And we had responsibility for Special Collections and Archives plus the Map Department, so we spent a percentage of our time doing maps. And then out at that counter there were four of us, myself and Leslie and then the Government Documents librarian Daryl Huskey and the Library Assistant III Karin Eyler who were the Government Documents people. And the four of us had specific shifts to man that counter, including evenings, one evening a week. And so we also did a lot of Government Documents work, so it wasn’t exactly 100% full-time Special Collections because we had maps and then Government Documents reference. But Leslie then was here for maybe four or five months, then she got a job elsewhere on campus, over in the Administration building, that probably would have been the spring of 1988, late spring. Mary Carter, who had done some work in Acquisitions, she was one of the applicants to take Leslie’s place. And I hired her and she stayed for 21 years. So it was Mary and I for quite a few years, then we got a half-time Technical Records Specialist, and the first person to hold that position was Sue Masoner and she did it for a couple of years, and slowly but surely has been upgraded and now it‘s a Library Assistant II, and that‘s the position Jim has. Do you remember what your first project or the first collection that you processed when you got here? Really Tom Trusky in English was waiting for me to arrive because he and Ralph Hanson, Ralph was the assistant librarian, we didn’t call them associate deans, we didn’t have those titles, but he was essentially an associate dean. They had been talking with the Shipman family about getting the Shipman collection, Nell Shipman’s papers, from the family. So once I got here the negotiations were turned over to me. I talked with Barry Shipman and that was pretty much the first collection that came in after I was here. As far as what I was processing first I can’t exactly remember. But I know Leslie and I were finishing up the processing of the Robert Limbert Collection. The Limbert collection had come in before I got here, and even before I got here, there was one person who was even finishing up the processing of the Frank Church Collection. One of the first jobs I had to deal with was Leslie came into my office on the very first day and sat down and said, “You know, there’s a student assistant who’s not working out and we’ve got to let them go.” So I thought she meant she was asking me to fire them. Gosh, my first day here, I’m being asked to fire someone already? What do I say? Do I say, well let me investigate his work? You know, it’s kind of something to be asked to fire someone on your very first day. So I said, “Do you want to send him into my office?” And Leslie said, “Oh no, they work for me. I just wanted to let you know, I hire and fire, I just wanted to get your approval before I do it.” I said, “Well, you’ve been working with them for however long. You hired them, you fire them if you think it‘s necessary.” So she did, but I thought I was glad I wasn’t being asked to fire somebody on my first day. That would really be a bang-up start! I was wondering if you could talk about some of the acquisitions to Special Collections through the years that you were really happy about, or that really stick out in your mind as being really significant. The Shipman collection being about the first that came in through the installment plan. Barry Shipman, already in his late 70s, 80s, sent his late mother’s papers to us, there have been 20 or 30 shipments coming, he’ll bundle them up and send a package. We really had to wait until all arrived before we processed it, so when it comes down to it, that was probably not the first collection I ever processed. There’s just so many of them, getting huge collections like Cecil Andrus really was a big deal. I remember the day we went out to the storage facility on Federal Way ’cause Pete Cenarrusa had gotten in contact with us and his storage unit was flooding. Water, yes. And so it was a rescue attempt to get that out, get all his papers out of that storage facility before, they wouldn’t all have been inundated with water, but leaking roof and water running through it, that would have been bad. We’ve been able to buy a few things, like the two diaries from the nineteenth century that we have, the Metta Ellis diary from 1890 and the William H. Chapman diary from 1866, those are highlights. You know, they are all interesting in their own way, so it’s hard to single out any single collection. If you had to pick an aspect of your job that you like the most, what would that be? Well, it’s looking at an unprocessed collection and figuring out, looking at it, going through it, picking out through out, in your mind deciding what series it will be divided into, and then doing the processing work and doing the finding aid and then seeing that finding aid finished and the collection looking in good order, that’s the best part of the job. Unfortunately what I don’t get to do much of anymore, when it was just Mary and I we would spend 85% of our time doing that and enjoying it. But the department’s grown and the patronage has grown and outside administrative work has grown. That’s right up there, I guess I should say equal to working with people, the patrons and the staff. Patrons come in and 99% of them are just wonderful people and just thrilled to find materials on their topic and a lot of them, it’s the first time they’ve ever been to an archives and they can be excited about that. And then others have done work in archives a lot and it’s nice to hear them say nice things about our operation, the way we have collections organized. But if there was one single project that was probably the most stimulating, it was designing the new Special Collections quarters. In the early 1990s, because groundbreaking was 1993, I remember it was at a rally or a meeting or something in the amphitheater right outside the library and all the library staff was there. It was announced, I think it was the Fourth of July or something like that, it was announced that the money had been appositional or decided to fund the addition to the library. And Tim Brown said that Special Collections would be moving into the new part of the library and start designing your space. Mary and I being able to plan out what we wanted the Special Collections to look like, that was a lot of fun, and we got pretty much what we asked for. What were some of the main components that you wanted? How long from start to finish did that take? I think it was announced in 1990 that it was going forward. And really we did most of our design planning, it was probably by 1991, 1992, and the groundbreaking, and by that time, by the groundbreaking the plans had been drawn. Groundbreaking was in May of 1993 because it was the Monday or Tuesday right after the Conference of Inter-Mountain Archivists. CIMA met in Boise in 1993, that was the year I was president of it, and we had the conference, and that very next week was when we had the groundbreaking. I think people were out in front of the fountain with shovels and Governor Andrus was there and quite a few others, we have pictures of it. That’s how I always remember it. We also wanted display windows in Special Collections, and it was late in the process, after the groundbreaking, when I was looking more closely at the design and it didn’t, it looks like they gave us windows, but I didn’t see any space for shelves. And so we had to consult with the architects and they said, “Oh no, we gave you display windows.” But what good would display windows be without shelves to put things in? The space for the shelves and then the cabinets underneath, thankfully we caught that before the building was done. As far as other things we wanted, I didn’t want carpet in the back because you’ve got to vacuum it and in theory it could off-gas. We were told, oh no, every room has to have carpet, but a concrete floor would have been fine for me. And I also wanted, the old front wall of the library is in the storage area, and I wanted that just to stay brick and they said no, the regulations say every interior wall has to be plaster so they wouldn’t leave it brick. But then I said no windows, and they said okay, so you know, I got no windows. That was good, so there are no windows in the back storage room, even though there is carpet and plaster on the front wall. When you all moved into the new space, about how many manuscript collections were there, just like a ballpark number? Oh gee, when I came here we had like 80 manuscript collections and that was in 1988, it had increased somewhat by the time we moved we had 120, something like that. I guess we could really tell by the accession books. And also some of the moving labels are still on some of the boxes, those labels with the green frog indicates it was moving. So we probably could tell by those, but we moved it all ourselves, with the help of a lot of student workers, not only our own, but some special hire student workers. And we had determined where everything would go on a shelf, so we weren’t just trying to move it in order, we knew where things were going to go. Was going to go on a certain shelf , yes. So we didn’t have to do a lot of rearranging. In fact, we pretty much mapped it out that we knew Box 131 was going to go on Range, whatever shelf, so that was pretty simple. You know it took a lot of planning, but once the plan was developed, it was easy to execute. So that wasn’t too bad. The hardest part was when, because of course there was no compact shelving, both sides were equal shelving. But when we went to compact shelving, we had to decide what we were going to do with everything on the right side of the aisle. And one option was to send it out to storage, but we didn’t want to do that, so basically it filled up the reading room, that boxes were stacked four high, I think we felt four was as high as we’d stack them without being tipsy, and we basically filled the reading room and the Frank Church Seminar Room. And we had to announce that for a couple of weeks, the certain collections in those stacks would be unavailable because there’s no way you could get to them. Some were on the bottom box in the middle of the reading room, these rooms were just packed. It was in the summertime, and that was the summer we had the fire in the, not in the library itself, but in the annex that’s over on the east end of the building. And the building had absolutely no electricity for 2 weeks, not even exit signs. The building was deemed not fit to be in, without exit signs or emergency lights going, you can’t occupy a building. So in the midst of building the compact mobile shelving, that crisis happened, and so basically the library was totally closed for two weeks. That was the summer of 2000. So everyone had a two week vacation? Everyone had a two week vacation. They asked that if you were doing any work from home, to write that down and somehow that could come out of the regular accounts, whereas the forced vacation, people weren’t charged leave or anything, but that sort of emergency they could draw less. That was long before things were as well developed in terms of the internet, working at home capability was nowhere near what it is today, so it was basically a two week free vacation for everybody. And I had probably the worst summer cold that I’ve ever had in my life. I never get summer colds, but that one I did. Well, it was two weeks off. I was wondering if you could share the story about why you decided to become an archivist. At first I was a history major and what’s a history major to do? And you were at the University of Maryland. I was attending the University of Maryland and taking history courses, and in the back of your mind, you wonder what you’re going to do because I knew I really didn’t want to be a teacher. At that point, I was a Junior or something, already getting burnt out and not necessarily wanting to go the Ph.D. route and all that. But I took a Maryland history course, history of Maryland, and the professor made us or told us to do a paper and you had to consult primary sources. And so I picked a topic and I had to go to the Maryland Historical Society and read through a man’s diary from the year 1739. And what was the topic on? The topic was on a slave uprising in my home county, Prince George’s County, in 1739. It had been reported briefly in the Maryland Gazette, the man had written in his diary and made references to it, and then of course there were court records about the trials of these slaves, once the insurrection was quashed. But never in detail was anything written in a secondary sense about it. People knew it had happened and there were brief references to it but no detail, so I decided to put all these sources together, use the Maryland Gazette which was the only newspaper in Maryland at the time, read this man’s diary, go through all the court records and testimony and like, and do my paper on that slave revolt. But I found working with the original materials was just so wonderful, I thought, “How do you get to work in a place that has things like that?” I found out a library degree and luckily the University of Maryland had a library school and that was really easy. You just graduated and you stuck around for another year plus the summer afterward and got the M.L.S. So then I applied for jobs all over the country, and the one that hired me was the Library of Congress right at home. I didn’t have to move, and so I went to work there and that was just a wonderful place, wonderful place to work, 21 million books at your command! I worked on the staff of the National Union Catalog of Manuscript Collections, and I really liked it. After 12 years of doing that, I wanted to get out and kind of run my own shop, and that’s what I did. Julia Stringfellow is an Archivist in Special Collections at Boise State University. In the Fall of 2008, the University of Idaho Library Reference Department began exploring opportunities for expanding reference services, which at the time consisted of in-person, phone, and e-mail reference. Librarians began researching emerging technologies and their application for reference, and the department decided to pursue adoption of instant messaging (IM) reference. We had several questions to answer before selecting a software and implementing the service. Who is our audience? Our primary audience included traditional college students, used to online multi-tasking, but also non-traditional students and faculty and staff. In addition, more UI students were taking distance education classes in remote locations, and the department felt that IM reference would provide additional outreach to these students. How are peer institutions implementing this service, or are they? A survey of peer institutions (land-grant universities) found that 66% offered chat or IM reference, either in-house or as part of a larger consortium service. What are our objectives in adopting this service? Our objective was to provide synchronous reference assistance to users in a relatively easy, effective, and low-barrier way. Finally, and perhaps most importantly, what potential barriers are there to beginning this service? Our department was lucky to have administrative support for the project, and librarians were generally positive and enthusiastic about implementing this service. Although cultural barriers were low, technical barriers still existed: software would need to be selected and installed, librarians would need to be trained on the new software, and the service would need to be marketed to patrons. What features do we need in a software? The library wanted software we could install and maintain ourselves, with widget functionality to embed in our library website. The software also needed to be open-source; like most libraries, the department did not have funding to adopt a proprietary IM client. We also wanted our users to be able to add UILibrary to their “buddy list” or simply to ask a question anonymously through the library website. The open-access social networking company Meebo fit the bill with their product Meebo Messenger. To implement the software, the department created an account within Meebo Messenger, and also created accounts on four popular IM clients: AOL, MSN, Yahoo, and Gmail. Syncing these clients with Meebo Messenger allows patrons to use their preferred platform to ask questions, which then feed into a central interface for librarians. Instruction on the software was also conducted for librarians, and included a group demonstration, one-on-one practice sessions, a “cheat sheet” at the reference desk, and a “soft launch” in the Summer of 2009 to prepare for the formal rollout in Fall 2009. The Reference Department officially began offering IM reference in Fall 2009. That semester, IM questions accounted for 2.9% of all reference questions, while IM questions accounted for 5.5% of reference questions asked in Fall 2010. Informal assessment has indicated that the service is popular with users and librarians, and the department may need to investigate a more sophisticated IM client to accommodate the increase in use by patrons. The launch of IM reference was so successful that the Reference Department wondered what other emerging technologies would lend themselves to innovative reference services, and agreed to explore the implementation of SMS (text) reference. A recent study by the Pew Research Center found that 18-24-year-olds send, on average, 109 texts per day: that demographic comprises the majority of our users, so why not leverage a technology students already use? Other motivations for exploring the service were the increasing presence of mobile technologies by users (and librarians), the need to keep up with technology trends in other academic institutions, and technological advances which opened the possibility for open-source SMS reference. While exploring available technologies, the authors discovered a blog post from Ohio University librarian Chad Boeninger, in which several freely available technologies were used in conjunction to implement a text reference service. After some evaluation, the authors decided to try it out at the reference desk, limiting the service to their personal mobile devices. The three technologies ingeniously mimic a telephone–there is a receiver, a ringer and a cord to connect the two. The “receiver” is Google Voice. Launched in 2009, Google Voice is a voice-over internet protocol (VOIP) tool which enables a user to maintain a telephone presence without purchasing a phone line from a traditional phone company. It also enables us to perform text reference from a web browser, rather than a dedicated mobile device. On signup for the service, Google registers a phone number that the user selects given the user’s location and the list of available numbers. For the reference desk, we selected a number with a 208 area code largely for symbolic purposes, since long distance is less of an issue than in the past. Before using it however, there are two very important settings to implement–call forwarding to the primary reference telephone number, and text forwarding to Google Mail (Gmail). Call forwarding permits the library to maintain its traditional phone number for reference services over phone, meaning the Google Voice service primarily is used for its text capacity. Gmail is used because of its natural integration with Google Voice. Gmail functions as the “cord” to connect the receiver, Google Voice, to the ringer, Trillian. Because Google also has an instant message service, called Google Talk, which requires a Gmail account, we are able to connect Trillian–an instant messaging client–via Google Talk/Gmail to the texts received by Google Voice. Trillian’s only purpose in this process is to notify the reference staff of a new text message. That is how it plays the role of “the ringer.” It produces an audio signal when it receives the message from Gmail. Without it, at our busy reference desk, notifications are often missed if they are not accompanied by an audio sound. And in general, we have found that one does not want to use commonly heard sounds for one’s reference environment. Setting up the service required a fair amount of attention to detail, but once established, using the service functioned much the same way as IM. An audio sound notifies the reference desk, a librarian views the incoming message, and types a response—albeit one of 140 characters! Text reference was implemented in Spring 2011, with a soft launch in Fall 2010. Training followed the same pattern as that of IM reference, featuring a demonstration, one-on-one training, and guidelines posted at the reference desk. Early assessment indicates that text reference is not being adopted by users at the same rate that IM reference was adopted (1% of reference questions), although text reference has only been offered for a semester and a half. There are several possible reasons behind the slow adoption: students may not be using their cell phones as anticipated; increasing adoption of smart phones and corollary internet access may have negated the need for text reference; patrons may not remember the text number, which is by necessity different than the pre-existing university-assigned phone number. The reference department plans to continue offering the service and reevaluate its effectiveness in Spring 2012. Text reference served as an initial foray into providing reference services for a mobile environment, and so a natural next step for the library was to develop a mobile-specific interface for our website. The mobile website was designed to support the increasing number of library members using mobile devices for much of their communication, studying and learning. Many public services librarians at UI have remarked on the range of patrons who use their phones to record call numbers and other bibliographic information before asking for help at the desk. We felt it was appropriate to provide these and other users with more mobile-friendly interactivity. Our chief task in design was making priorities of our website content. Not all content can be displayed well in the mobile environment, and frankly, not all content needs to be. We settled on three categories: contact information, library hours, and the library catalog. This philosophy of simplicity over comprehensiveness may be unusual to most librarians, but it was felt by the designers to be essential for creating an efficient but usable mobile interface. Simplicity also allowed us to retain one of our primary goals: keeping the page “shallow.” This means that the website has a user move a maximum of three pages into the website before either reaching a page with no further sub-pages, or reaching a page which only contains links off of our website, e.g. to bibliographic databases. What this means is that users are never more than two clicks down from the homepage and this restriction forces the designer to keep the entire website simple and clear. The first iteration of the mobile website was developed very quickly by a member of the library staff. This design was never intended to be permanent, simply an exercise in creating a mobile alternative to the library’s website as our existing website did not display well on mobile devices. The content was discussed briefly by the library’s Web Committee–which approves all major web-related changes–and approved to become publicly accessible. Over the next year, however, there was a sense that the mobile website neither exploited our resources fully nor provided a consistent experience together with the traditional library website. Specifically, there were three major problems: 1) user interface, 2) branding and 3) functionality. First, our links were not spaced properly. For touch-screens, such as on the iPhone or Android devices, links need to have sufficient space around them to prevent a user from accidentally clicking on the wrong link using their fingers. Also, each page was exactly that, a separate page. This meant that to move from one page to another required a separate request to the server; a new page had to load. If network connectivity problems occurred for the mobile user, the request had the chance to fail and the new page would not load. Thus, fewer requests mean there is less chance of interruption. Second, our website was only partially branded. For a university library, brand affiliation with the larger university is essential. It reminds users “where” they are on the Internet, who they are affiliated with, and provides a visual consistency that corresponds to their own identity, either as members of the University of Idaho community or as visitors from outside. The University of Idaho, like many other higher education institutions, maintains a brand and style guide governing the visual output of the institution’s various departments and units. While we did not have specific mobile guidelines, there were color and image specifications that were not consistent with our main website or the university’s. Third, the mobile website failed to exploit all possible mobile-friendly resources or communication protocols of modern mobile devices. For example, a number of our databases had developed mobile versions, but had yet to be activated by us, or added to the website. Further, our contact page failed to access the text messaging functionality of a phone when a user clicked on the text reference number, or the telephone functionality when a user clicked on the phone number. We also enhanced the visual style of the page using the jQuery Mobile design. Aside from widening the space around the links, providing cells around the links and “Back” and “Home” buttons, it also provided a simple opportunity to brand the colors according to the University of Idaho requirements. We added the gold and silver colors, as well as improving the logo, and the page took on a dramatically improved, appropriate and consistent tone. Lastly, a thorough inventory of our databases was conducted and all mobile-friendly versions were added. EBSCO-based databases required activation by our local EBSCO administrator, and all database links were prefixed with the URL for the proxy server, thus requiring authentication by all users. This is especially important given that many users will be accessing the site from non-University networks, such as wireless carriers Verizon or AT&T, even if they are on-campus. Therefore, the database servers will not recognize their IP addresses. Finally, we gathered the appropriate URIs for different types of communication protocols and encoded the contact information with the correct ones, e.g. tel: for telephone numbers, mailto: for email addresses, and sms: for text message numbers. This important addition allows users to simply touch a phone number and automatically activate the calling function on their device, for example. In all, these changes made the website much more clean, effective and useful for users. We are still updating the website as necessary, but are very happy with the most recent version. The initiatives described above are presented as models for other libraries seeking to implement similar services on a budget. Each project was implemented using open-source software, which means no bills for either software or server space. Each initiative is relatively low-risk and takes a minimal amount of time to install or implement (budget several hours for each), although time spent planning, testing, and training librarians can often, and should often, take longer. In particular, the IM and text reference implementation was simple enough that any library, regardless of technical expertise, could replicate our experience, although creation of a mobile library website may require assistance from library IT personnel. The University of Idaho Library has been very pleased with these services, which have allowed us to expand and enrich our services to reach previously underserved users and take advantage of new and exciting technologies. For more information about the University of Idaho’s mobile initiatives, see http://www.idaholibraries.org/files/Mobile_Initiatives_UI.pdf. Kristin J. Henrich and Jeremy Kenyon are Reference & Instruction Librarians at the University of Idaho. Idaho’s children are not competitive in today’s world of a knowledge-driven economy. The statistics tell a story of chronic unpreparedness for life beyond high school. Librarians, working together, have the ability to change this narrative. Librarians see children move through the informal and formal education systems. Starting with pre-kindergarten early literacy efforts in the public libraries (or in some communities, greeted with their first books in the hospital delivery room), public librarians become the first wave of child educators. When these children enter the schools, their school teacher-librarians offer opportunities for children to have library experiences in an independent setting. The public librarians continue to support informal learning and children’s access to these opportunities is dependent upon parental support (transportation and time and parental values). Throughout the school career, the classroom teacher (credentialed through institutions of higher education) may have the greatest impact on student research development. Finally, upon graduation, less than three in eight of these children will continue their learning in community colleges or four-year institutions. Faced with these larger truths, what can a librarian do? Collaboration is a term being used in all sectors of the economy as a means of achieving greater good with existing resources. According to Kezar and Lester,11 businesses and other organizations recognized in the 1980s that “’siloed’ work with duplicative activities and a lack of communication and synergy across function was not working anymore.” This realization gave rise to an understanding that organizations needed to be reformed, following new ways of operating. This reflection led to the adoption of flatter organizational styles, more team emphasis, and more awareness of building partnerships and collaborations. Collaboration has many side benefits: it makes us work up because we want to deliver our best efforts to achieve the team goals; it makes us work differently because we are considering our problems from more diverse perspectives that make our solutions stronger and more adaptable; and it creates learning opportunities as we want to continue to contribute our skills to make a difference in our work. Librarians are siloed based upon the types of institutions we work in. Public librarians have little contact with academic librarians who in turn have little contact with school librarians. We hold inter-agency meetings but we retain our identities by attending the meetings that we feel will best contribute to our specific library type. There are few opportunities for us to discuss universal issues. The faces of our children, however, should provide a unifying theme for us. Or the fate of Idaho’s future economy may be the trigger. There are probably many different ways to project our concern based on the facts we see before us. Librarians need to reach out to one another and address such questions as: how does my library make a difference to a child’s graduation from high school? What changes could I make in my behaviors that would make a child feel welcomed and safe? What do I know about the libraries and librarians in my community? Am I aware of challenges in the schools to provide library services? Do I know about public library services being curtailed due to funding? How can I help another library be successful in its mission? If we take the time to explore our own communities, we may be able to develop strong networks. We may be able to provide information for our local leaders to help them understand the importance of librarians to our children. We may be better informed about how we collectively might help one another as well as ourselves. The need is there. Are we willing to step forward to try to find ways to meet the need of our children and our future? 5 Idaho Division of Public Health, Bureau of Vital Records and Health Statistics, “WIC statistics”. 7 Heckman, J.J. 2008. “Schools, skills, and synapses,” Economic Inquiry, 46(3), pp.289-324. 11 Kezar, A. J. and Lester, J. 2009. Organizing higher education for collaboration. San Francisco, Jossey-Bass, p.8. Lynn N. Baird is Dean of Library Services at the University of Idaho; Stephanie Bailey-White is Projects Coordinator at the Idaho Commission for Libraries; Ben Hunter is Head of Cataloging and Collections at the University of Idaho Library; and Ann Joslin is the Idaho State Librarian.